Formed at Martlesham Heath on 25 August 1942, it received Hurricanes and began training as a fighter bomber squadron. Its main equipment began to arrive the same month and by October it was fully equipped with Typhoons 1A and 1B. Operations began in 3 January 1943 with two Typhoons attacking installations at Bruges. It then undertook training in support of the Army and shipping before continuing its intruder operations in April. 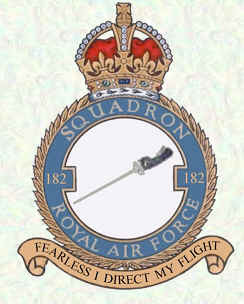 The following June the squadron became part of 2nd Tactical Air Force and adopted a mobile tactical role. As with similar units it carried out attacks against V1 sites from January 1944 before concentrating on attacks against targets associated with the forthcoming Operation Overlord. Following the invasion the squadron supported the armies as they gradually moved forward and in July 182 relocated onto the continent. As the armies moved towards Germany, the Typhoons of No 182 followed them through the Low Countries and into Germany itself, where it disbanded on 30 September 1945.